Hi everyone, it’s been ages since I’ve written for the blog and it’s because life’s been bloody hectic! 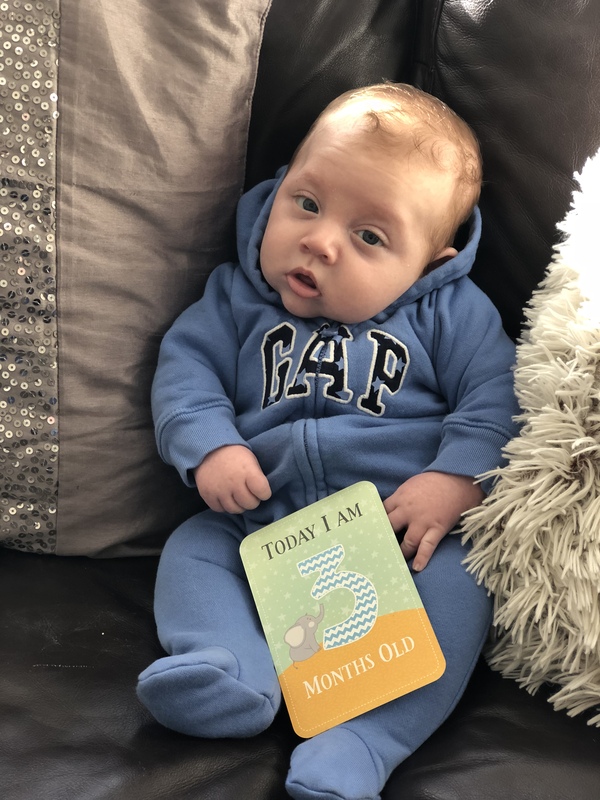 I can not believe Roman is 3 months old already, he’s changed so much in that time and He’s slotted into our family life perfectly. I’m just thinking when the last time I sat and wrote was, and it was when I posted Roman’s Arrived! That seems forever ago now. It’s taken 3 months to get my bearings together and to be honest I’m still having days that I just say “sod it” and do nothing all day. This is probably due to not having a full nights sleep since Roman arrived as he’s still so uncomfortable. We’ve had him checked for milk intolerances and dairy allergies, he’s had colic and he suffers badly with reflux so he’s on a special anti-reflux milk now to help him keep it all down. The milk change is definitely best for him, but around 6-10 weeks old was a rough ride! I was at the doctors with him constantly and felt like I was being fobbed off every time- but even though he’s still slightly unsettled during the evenings and at night, I do think sticking to this milk and doing all the little tips and tricks after feeds has definitely helped and we’ve had some improvements. At the moment we’re getting ourselves into evening routines, so we find he’s mostly unsettled between 6-9pm which will be the times we bath and play and have him sat up watching what’s going on and the by 9pm he’s usually asleep ready for a dream feed at 11pm and down for the night. He’s such a hungry baby and because we can’t put him on a “hungry baby formula” he has a ounce more before bed to carry him through the night and he usually goes until 7/8am the next morning! Don’t presume we sleep through the night though, oh no Roman likes to wake a couple of times through so by about 5am we’re safely co-sleeping in our bed for 2hrs max before we’re up at 7ish with Connor. Now before I get any judgmental comments on this post I’ve done my research on safely co-sleeping with Roman and it’s working for us at the moment. As soon as he decides to settle properly and sleep through he’ll be staying in his next to me cot ALL NIGHT but until then I need to be relatively human for both boys sake during the days and when Millie is here too our house is a full on circus so I definitely need some sort of energy to run on! The kids are obsessed with him, Connor adores his baby brother and always wants to make him smile- after school he asks how he’s been and if he’s been a bit of a grump Connor insists it’s because Romans missed him! Millie wants to know the ins and outs of everything! She asks what I’m doing or why I’m doing it, she always wants to help with whatever we’re doing and I can always find her letting him grab her fingers! Millie and Connor are quite close in age, there’s about 1 year and 10 months between them so when Connor was born Millie couldn’t help and she was too young to anyway but they’ve grown up together- with Roman he’s got a brother and sister that are old enough now to help out with him and it’s lovely for everyone. Roman is smiling now, he’s so funny because you can tell what mood he’s in the minute he wakes up! I can almost guarantee we’ll get no smiles first thing in the morning, he’s clingy and just wants mummy cuddles all morning which proves hard doing the school routine! But by lunchtime he’s such a smiley baby and it’s so nice to see him changing and being so alert and smiling away! I’ve started picking up some little fruit purées and baby porridge and rice when I’m out food shopping, it’s just building up the baby cupboard for when I start weaning him in a month or so. Again people will have there opinions on baby weaning etc but Connor was weaned onto porridge and fruit purées at 4 months because back then I didn’t have anyone telling me not too and if you saw Connor you’d see he’s perfectly fine, he has no tummy problems and has a good appetite. Roman is a lot hungrier than Connor was so I just know he’ll be needing something a little more substantial between 4-5 months. I think parents need to remember that we’re all different and our babies aren’t robots, they’re not all exactly the same. As long as you seek advise from your health visitor then you do what’s best for your baby. I’ve come to realise that I know my baby best, I feed him 24/7 and I’m with him 24/7 not doctors or HV or professionals. So take all the advise, make sure it’s safe to wean or safe to co sleep and if it’s right for you and your baby then do it. Connor was a textbook baby really, he slept through the night fairly quickly, stayed in his own cot/bed all the time, he didn’t over feed, he loved his foods when I weaned him and he’s ticked all boxes as he’s grown up. Roman has been a little more challenging which many parents tell me the second always is because you half expect them to be exactly the same as the first but we’re getting there slowly.